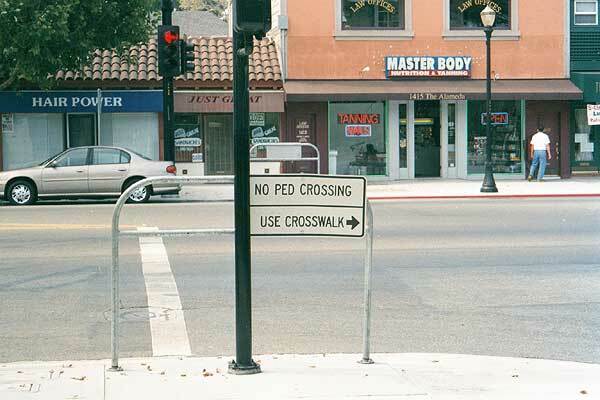 All over San José, one comes across prominent no-pedestrian-crossing signs. These are especially common on the left side of "T" intersections, as seen in this photo taken at the corner of The Alameda and Lenzen. In a typical example, a proper pedestrian crossing is made available only on the right side of the "T." As such, no one can accuse the City of making it impossible for a pedestrian to cross the street—it has merely been made inconvenient. These missing crosswalks are sometimes justified by traffic engineers in the name of "protecting" pedestrians from speeding left-turning traffic. However, it is possible to design an intersection such that it enforces pedestrians' right-of-way, if one wishes. If an intersection's design is is not pedestrian-friendly, it's clear that the priority is cars, not people. Design decisions are not accidents. Anti-pedestrian intersections can also justified by stating that so-called level-of-service guidelines must be maintained. Of course, these level-of-service guidelines can apply only to cars, making them impossible to dispute in the name of lowly pedestrians—it's as futile as trying to argue with someone over his/her choice of religion.